Baseball.net 2K2, multi-player online game, coded in Java! My love of sports motivated me to make the first multi-player online baseball game. It was an ambitious dream but a good way to learn and master Java. Although the user had to install a Java Applet Player, this game – in theory – could be played on any platform. This game is a multi-threaded game with several panels on the main screen. 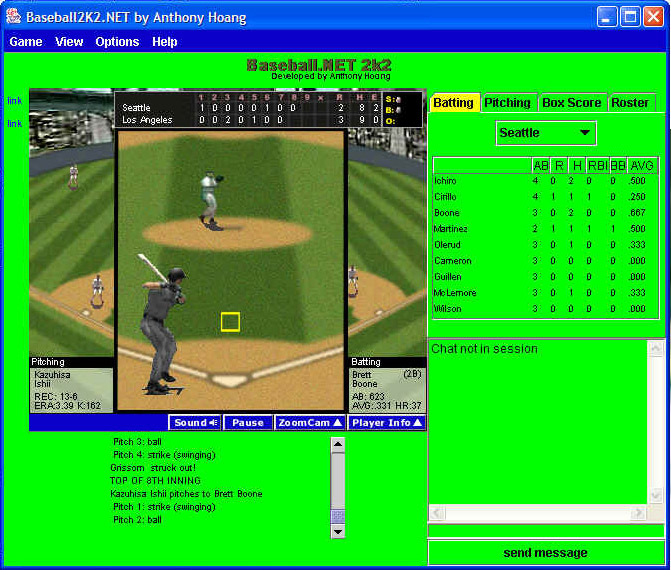 The main screen has the game action; the pitcher vs batter. The game uses real MLB player names and statistics. The other panels includes real-time, play-by-play, current game stats of batters and pitchers. An additional panel for the chat session is available when playing online against another player. When I was a child, my dad would draw a grid with many squares and tell me to write an “X” in one of the squares. He taught me to play Tic-Tac-Toe for “advanced players”. Instead of having to get 3-in-a-row to win, I had to get 5-in-a-row to take the game. I enjoyed this version of 5-in-a-row Tic-Tac-Toe so much, I decided to make an online version for multi-player gaming. The game is built on the Adobe Flash technology, specifically with the Lingo programming language. My online version supports two-player modes with a chat feature for players to converse while playing. The game requires a dedicated web server to handle incoming and outgoing requests for online gaming between two players. *update: My dedicated Shockwave Flash game server has been taken offline. I moved and no longer use a static ip address for my home web server. Someday, I will reboot this game in a more modern platform… maybe Facebook?